Repair Toolbox, a company known for its deep expertise in the field of data analysis and recovery, and one of the major suppliers of specialized data recovery tools, proudly presents a substantially updated and improved version of DWG Repair Toolbox, one of the company’s most successful products. 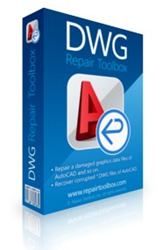 Created for users who don’t know how to repair DWG file data, the program provides everything necessary for fast, convenient and comprehensive data recovery from damaged AutoCAD DWG files. the program provides everything necessary for fast, convenient and comprehensive data recovery from damaged AutoCAD DWG files.